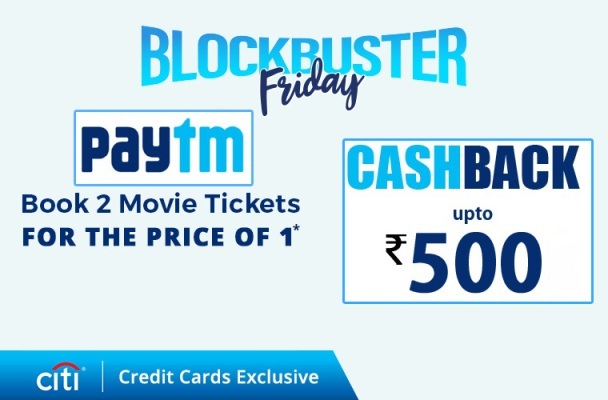 Paytm Movie Offer- 'CITIFRIDAY' | Get Upto Rs 500 Cashback on Citibank Credit Card. To book at least two tickets every Friday using Citibank credit card, use the promo code- CITIFRIDAY, and get 100% cashback (upto Rs 500) on the second ticket. To avail the offer during proposal period, book at least two tickets. The offer is valid for booking movie tickets during the offer period every Friday. Customers will be considered eligible for transactions using their Citibank credit card. Cashback will be deposited in the customer's Citibank card, which was used to book on Paytm. Offer is valid from 06 April to 28 December 2018 (23:59 hours).